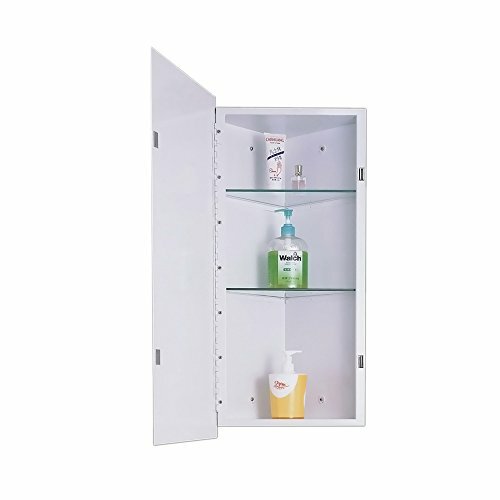 Ketcham Cabinets Surface Mounted Space Saving Corner Cabinet Beveled Edge Mirror 14"X36"
Tight rooms can benefit from a well-placed medicine cabinet. The Corner lets you take full advantage of corner installations without concern for binding the door when opened. An ideal fit for those special, small powder rooms. The Corner cabinet has many flexible installation options to make your life easier. Space saving corner cabinet. Surface mounted stainless steel framed single door medicine cabinet. Mount Options: Surface Mounted. Overall Size: 14"Wx 36"H. Overall Weight: lbs. Mirror Type: Beveled Edge Mirror. Shelves: 2. Corner Medicine Cabinets are fabricated with 20 gauge white baked enamel. steel bodies and doors. Mirrors/Doors: 3/16" first quality plate glass. Doors are mounted on a full length piano hinge equipped with magnetic door catch. Shelves: Removable 1/4"rounded edge glass shelves mounting on fixed shelf brackets. Product Care: Following these cleaning instructions and using the approved cleaning solutions will keep your Ketcham Medicine Cabinet bright and beautiful throughout it's life. The following cleaning solutions are recommended to clean your medicine cabinet mirror. Apply the solution to a soft clean microfiber cloth first this will prevent spillover onto the mirror edges or back of the mirror. This will prevent premature medicine cabinet mirror corrosion. Acceptable Cleaning Solutions: Vinegar-water solutions (less than 5% vinegar). Ammonia-water solutions (less than 5% ammonia based). This solution is only to be used if they do not contain ANY alkali, as this will cause mirror spoilage. Alcohol based solutions (less than 5% ethyl, methyl or rubbing alcohol solution. DO NOT clean your medicine cabinet mirror with any knives, scrapers, emery cloth, scouring sponges or any abrasive materials. DO NOT use alkali or acid cleaning solutions, as this will severely damage the medicine cabinet mirror. Country Of Origin: China. Warranty: 1 year. If you have any questions about this product by ketcham Cabinets, contact us by completing and submitting the form below. If you are looking for a specif part number, please include it with your message. Linen Tower Free Standing Mirror Cabinet Made w/ Manufactured Wood in White 66.73'' H x 11.81'' W x 6.89'' D in.